Gender persists as a key site of social inequality globally, and within contemporary south Asian contexts, the cultural practices which make up ‘masculinities’ remain vital for understanding everyday life and social relations. Yet masculinities, and their discontents, are an understudied and often misrepresented facet of gender relations and cultural dynamics. 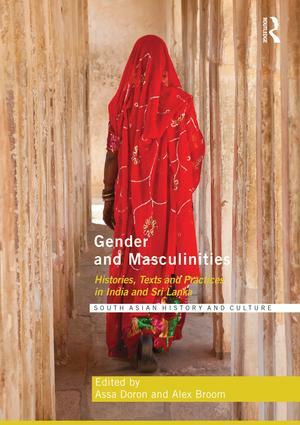 Gender and Masculinities offers a collection of chapters that seek to unravel the complex ideas, practices and concepts revolving around gender structures and masculinities in India and Sri Lanka. The contributions to this volume draw on a range of disciplines, including history, comparative literatures, religion, anthropology, and development studies to illuminate the key issues that have shaped our understanding of gender relations and masculinities over time and across a range of geographical areas. By carefully attending to historical and contemporary gender ideologies and practices in South Asia, this book provides a critical exploration of masculinities in their plurality, as shifting, culturally located and embedded in religious ideologies, power relations, the politics of nationalism, globalisation and economic struggles. The volume will attract scholars interested in history, anthropology, sociology, nationalism, colonialism, religion and kinship, and popular culture. This book was published as a special issue of South Asian History and Culture. Assa Doron is a Fellow in the Department of Anthropology, the School of Culture, History and Language at the Australian National University. He is author of Life on the Ganga: Boatmen and the Ritual economy of Banaras (Cambridge University Press/Foundation, 2013); and co-author (with Robin Jeffrey) of The Great Indian Phone Book: How the Cheap Cell Phone Changes Business, Politics, and Daily Life (Harvard/Hurst, 2013). Alex Broom is Associate Professor of Sociology and Australian Research Council Future Fellow at the School of Social Science, The University of Queensland, Australia. He specialises in the sociology of traditional, complementary and alternative medicine (TCAM) and the sociology of cancer and end-of-life care. Recent publications include: Traditional, Complementary and Alternative Medicine and Cancer Care (Routledge, 2007), Therapeutic Pluralism (Routledge, 2008), Men's Health: Body, Identity and Social Context (Wiley-Blackwell, 2009) and Health, Culture and Religion in South Asia (Routledge, 2011). This books series offers a forum that will provide an integrated perspective on the field at large. It brings together research on South Asia in the humanities and social sciences, and provides scholars with a platform covering, but not restricted to, their particular fields of interest and specialization. Such an approach is critical to any expanding field of study, for the development of more informed and broader perspectives, and of more overarching theoretical conceptions. The idea is to try to achieve a truly multidisciplinary forum for the study of South Asia under the aegis of which the established disciplines (e.g. history, politics, gender studies) and more recent fields (e.g. sport studies, sexuality studies) will enmesh with each other. A focus is also to make available to a broader readership new research on film, media, photography, medicine and the environment, which have to date remained more specialized fields of South Asian studies. A significant concern for series is to focus across the whole of the region known as South Asia, and not simply on India, as most ‘South Asia' forums inevitably tend to do. The series is most conscious of this gap in South Asian studies and works to bring into focus more scholarship on and from Pakistan, Bangladesh, Sri Lanka, Nepal and other parts of South Asia.